Neil did very little wrong but Ronnie was almost unplayable on the day. Despite the disappointment of losing Neil was happy to be part of snooker history, and a very special moment: indeed Ronnie made three centuries during the match, including a 134 in the last frame, which was the 1000th century of career. As he was potting the last balls, the crowd was on their feet applauding and cheering every pot. That 134 could easily have been a 141 … if Ronnie hadn’t pocketed the white whilst potting the last black. That meant that Neil had a small consolation: his 140 remained the High Break of the tournament. Two more Grove players were involved: Jack Lisowski beat Kyren Wilson by 6-4 in the last 16, and lead Judd Trump by 5-2, only to lose 6-5. 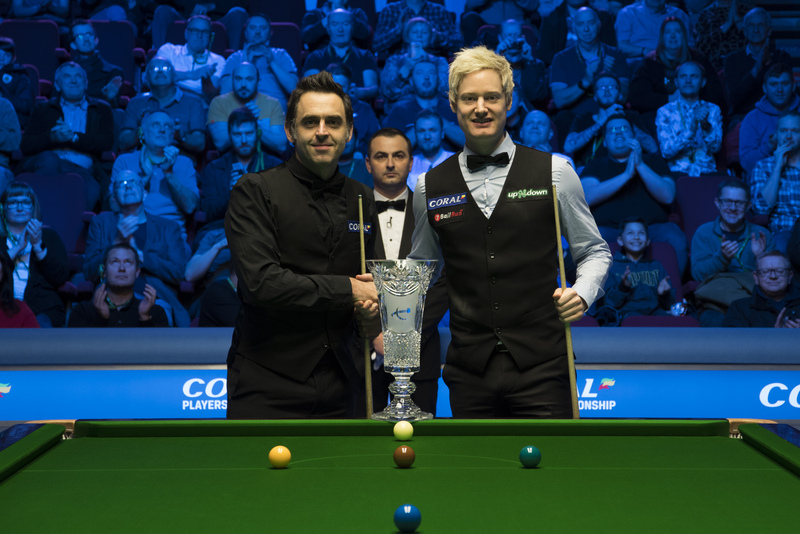 Having survived that, Judd faced Neil Robertson in the semi finals, lead by 3-1, only to lose by 6-4.